SEOUL, May 15 (Yonhap) -- Some 400 Buddhist leaders from around the world will gather in Seoul Friday for a three-day conference to pray for Korean reunification and world peace. 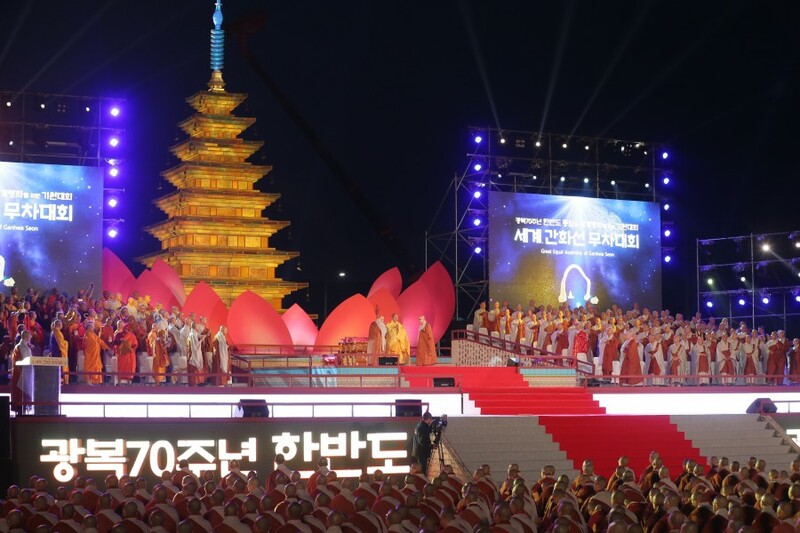 Prepared to mark the 70th anniversary of the Korean liberation from Japan's 1910-45 colonial rule, it will be the largest Buddhist event ever to be held in South Korea. Some 400 Buddhist priests, including 180 at home, will attend the Conference for World Peace and the Reunification of Korea from Friday through Sunday, according to the Jogye Order, the country's largest Buddhist sect, which organized the event. Among the attendees are Most Venerable Jinje, supreme patriarch of the Jogye Order; His Holiness Tep Vong, the supreme patriarch of Cambodia; Ven. Niyangoda Vigithasiri Anunayaka Thero, deputy head of Sri Lanka's Siam sect; and Ven. Upannyajota Mahathero, founder and chief priest of Bangladesh's Golden Temple. Leaders from other religions, including Bawa Jain, secretary-general of the World Council of Religious Leaders, will also take part. The conference will begin with a welcoming reception Friday night and participants will pay tribute at Seoul National Cemetery on Saturday morning. In the afternoon, they will hold the Religious Conference for World Peace at Seoul's Grand Hilton Hotel. During the conference, some 20 participants, including Ven. Jinje and Rev. James Kowalski, dean at the Cathedral of St. John the Divine in New York City, will discuss the role of religious people for world peace and adopt a written prayer for this. The highlight of the three-day Buddhist conference will be the Great Equal Assembly of Ganhwa Seon, an open-door religious service, to be held at Seoul's Gwanghwamun plaza in the evening. Organizers expect some 200,000 people, including local Buddhists, will be assembled for the service intended to promote Ganhwa Seon, a traditional method of practice in Korean Buddhism. Before the service, the priests participating in the conference will meet families who lost their loved ones when the ferry Sewol sank in southwestern waters last year claiming more than 300 lives. On Sunday, participants will hold a large-scale memorial service at Jogye Temple in central Seoul to console victims of the 1950-53 Korean War.